This photo of Ceres was taken by NASA's Dawn probe on Feb. 19, 2015, from a distance of about 29,000 miles (46,000 kilometers). On Friday morning (March 6), NASA's Dawn spacecraft will arrive at Ceres, becoming the first probe ever to orbit a dwarf planet. Ceres is the largest object in the asteroid belt between Mars and Jupiter, and the closest dwarf planet to Earth. Dawn is expected to provide a wealth of information about Ceres' evolution and composition. 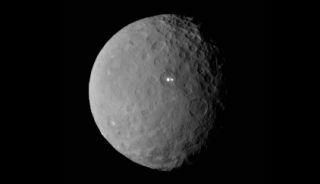 Ceres was first spotted on Jan. 1, 1801 by Sicilian astronomer Giuseppe Piazzi. The asteroid was found after Piazzi followed up on mathematical predictions (later determined to be false) that there should be a planet between Mars and Jupiter. At first Ceres was called a planet, but as more asteroid belt members were discovered, Ceres was demoted to asteroid. Its status changed again in 2006 when it was promoted to dwarf planet — a classification it shares with Pluto, which was demoted from full-fledged planet that same year in a move that remains controversial today. Piazzi called his discovery Ceres after the Roman goddess of harvests and corn. She also was considered the patron goddess of Sicily, according to the Encyclopedia Britannica. In 1803, the element cerium was named after the dwarf planet. Cerium is the most abundant of rare-Earth metals, the encyclopedia says, and (among other occurrences) it is found as a fission product of plutonium, thorium and uranium. As Dawn sped towards the dwarf planet in late 2014 and early 2015, astronomers found two surprise bright spots at about 19 degrees north latitude on Ceres, inside a crater. There don't seem to be any mounds or features close to these spots, which suggests that they are not volcanic in origin. The bright spots indicate a highly reflective material, likely water ice or salts, researchers say. Dawn team members hope the spacecraft will solve the mystery. The Herschel Space Observatory recently spotted water vapor emanating from Ceres. The plumes appeared to be generated from two locations (including close to where the white spots were found) and could be a product of icy volcanoes, scientists have said. The vapor may also have sublimated off after a meteorite strike exposed subsurface ice to space. The plume's nature is another mystery for Dawn to investigate. Water-vapor geysers would hint at the presence of a subsurface ocean on Ceres, which might be capable of supporting life as we know it, some scientists say. Icy moons of the outer solar system such as the Jovian satellite Europa and Saturn's moon Enceladus are thought to have underground oceans, which are apparently kept liquid by tidal forces generated by the gravity of neighboring moons and their huge host planets. Ceres would not experience such tidal forces but could possibly retain some radioactive heat from elements in its interior. Unlike other members of the asteroid belt, Ceres is round, because it's large enough for gravity to mold its shape into a sphere. (Ceres is about 590 miles, or 950 kilometers, wide.) Scientists also believe that round bodies tend to have differentiated interiors, meaning that there are different zones inside of them. Ceres probably has a rocky core, an icy mantle, perhaps some subsurface liquid water and a dusty top layer. Ceres is relatively far from the sun, but scientists believe its surface temperatures could rise as high as minus 37 degrees Fahrenheit (minus 38 degrees Celsius). If there is any water ice at the surface, it would quickly sublimate — change directly to a gas — which could generate an atmosphere around the dwarf planet. That said, there have only been a few observations of possible sublimation to date. Dawn will be on the lookout for more. Editor's Note:The online Slooh community observatory will air a special Ceres webcast featuring live telescope views of the dwarf planet on Friday beginning at 1 p.m. EST (1800 GMT). You can watch it live directly at www.slooh.com, or here at Space.com.